Octopuses can be fascinating pets for people who have extensive experience with saltwater aquariums. These ocean creatures have very specific requirements—including for tank setup, water quality and maintenance—and pose unique challenges. If you have the knowledge, time, money and dedication, though, you might find an octopus to be an educational and enjoyable pet. An increasing number of people have started to breed octopuses and sell them as pets. While you probably won’t find them in your local pet store, you can check websites such as TONMO (The Octopus News Magazine Online) for information about buying a captive-bred octopus. 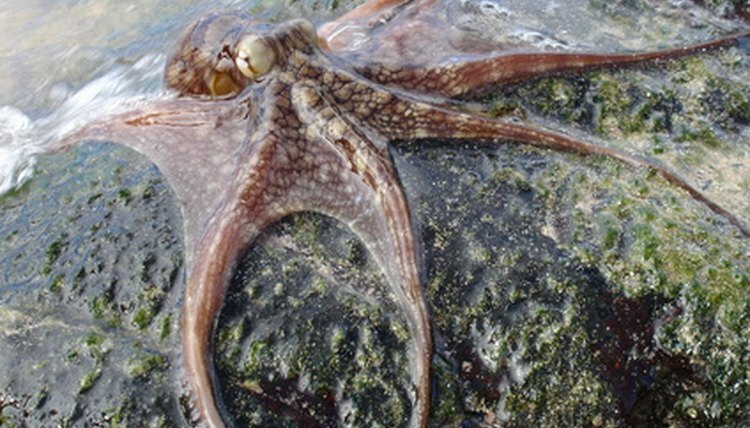 Many people still catch their pet octopuses in the ocean, though. One drawback to this is that you won’t know the octopus’ age, and because their lifespan is so short—six months to five years, depending on species—you might not have much time with your new pet. Also, before you remove her from her native habitat, check state and local laws; octopus collecting is prohibited in some places. Your octopus must have her own 15- to 30-gallon aquarium, depending on her size. Because octopuses can fit themselves into and through small cracks, seal or cover any hole large enough for your pinky finger. Add weights to the lid so she can't lift it and squeeze out. Provide her with plenty of hiding places. Her water needs to be filtered and frequently cleaned, especially after she eats. Regularly test to make sure water doesn't have high levels of copper or low oxygen concentration, either of which could be fatal. Voracious predators, octopuses often devour crustaceans, mollusks and fish who share their tanks, and they sometimes even cannibalize their own kind. Some octopuses eat thawed shrimp and other crustaceans, but many prefer live prey—and people often enjoy watching them hunt. Crabs, shrimp, crayfish and mollusks provide nutrition similar to what your octopus would receive in the ocean. You can also incorporate fish into her diet, but avoid feeder goldfish, which are extremely fatty and can actually shorten your pet's life expectancy. If your octopus declines food and won't emerge from her lair, especially after you've had her for a few weeks, she might be ill. White or pale coloration can also indicate health problems. If you see any of these symptoms, take her to a vet who specializes in marine animals. Most octopus species live only one or two years, although some have slightly shorter or longer life spans. Females often stop eating around the time they lay eggs and die shortly after their offspring hatch, but a female whose eggs haven't been fertilized follows the same pattern. Males have similar life expectancies. Can You Have a Dumbo Octopus as a Pet?